People who want to learn about and take action on the world’s biggest challenges. Extreme poverty ends with you. Check out original content and videos published every day to help you learn about the issues that mean the most to you. Send petitions, emails, or tweets to world leaders. Call governments or join rallies. We offer a variety of ways to make your voice heard. Meet other Global Citizens who care about the same issues you do. Keep updated on what they're doing to change the world. Period stigma and misconceptions can even impact women's access to medical care. Girls and women around the world experience period stigma that can negatively impact their lives. Period poverty and shame can interfere with women's education, employment, and health. You can take action here to help fight against period taboo and support women and girls everywhere. Jennifer Weiss-Wolf may be considered the "architect of the US policy campaign to squash the tampon tax," but even she struggles with her period every now and then. Wolf recently spent 15 minutes inside the bathroom stall at her workplace, the Brennan Center for Justice at NYU School of Law, trying to "manage" her period, which had arrived unexpectedly. "I had tights on and didn't feel like dressing myself completely just to go out [to get a tampon] ... I thought: It's great that we provide menstrual products now but they are out there and I am in here," she told Global Citizen. She checked to make sure no one was around and then she dashed out to grab a tampon, her tights still gathered around her ankles, and hurried back into the stall only to find drops of blood on the floor. "So now I was on my hand and knees scrubbing all of the floor and thinking: What the hell am I doing?" And then she wondered, "What are these 11-year-olds up against if this is happening to somebody who has been menstruating for a good solid 40 years?" This might seem like a very personal story to share with someone she'd just met, but speaking openly and candidly about menstruating is kind of Wolf's thing. For years, she has worked to dismantle period stigma and change gender discriminatory policies like the taxation of tampons as "luxury items." She says her dinner conversations often revolve around periods, which she can tie to everything from poverty to women's rights to economic development. She's even written a book about periods, called Periods Gone Public: Taking a Stand for Menstrual Equity. On Monday, Wolf was joined by three other panelists at "Talking Menstrual Equity. 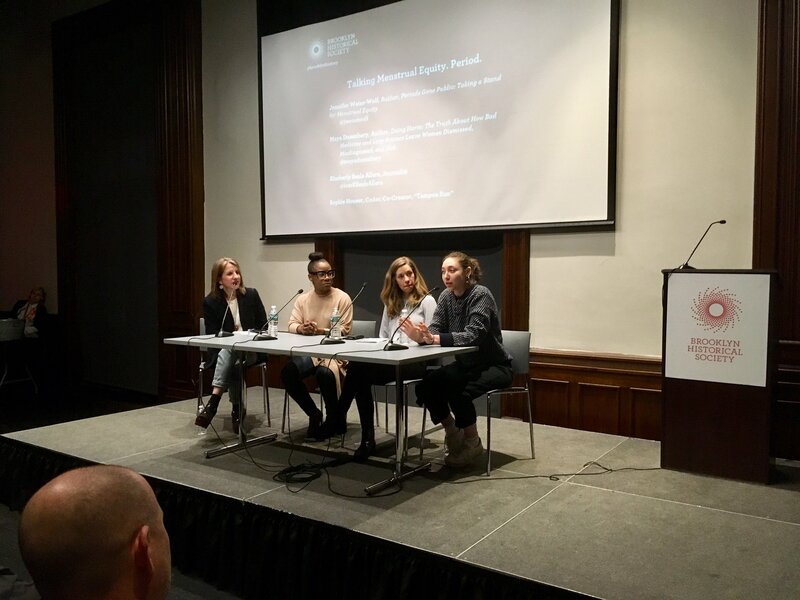 Period," a discussion held at the Brooklyn Historical Society (BHS), where they discussed her favorite topic: periods. “The more we tell stories, the more people step up to act," said Wolf, the co-founder of Period Equity, an advocacy organization fighting for menstrual equity. Wolf hosted the panel, which also included author Maya Dusenbery, journalist Kimberly Seals Allers, and activist Sophie Houser. Dozens of people — almost all female — listened as the women addressed inaccessibility to menstruation products, not just as an issue that affects people in developing countries, but one that is also common in the US. Another significant theme the panelists highlighted was the need to normalize female bodily functions. "Society and culture don't support women on the natural things like birth, breastfeeding, and also menstruation. Lack of policies that properly support women whether it's paid maternity leave or tampon tax furthers the issues," Seals Allers said. Her particular goal is to normalize infant feeding in the US, but much of the shame women are made to feel about public breastfeeding shares roots with period stigma. Houser, who co-created the video game Tampon Run at the age of 17, echoed this sentiment, speaking about her experience with period stigma. 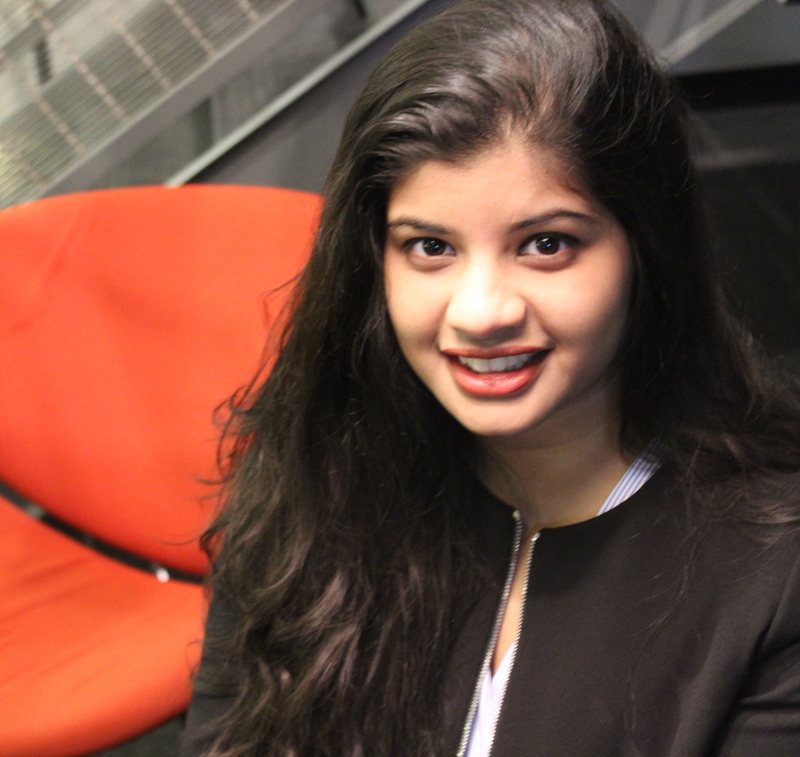 "When I began work on Tampon Run, I was 16 and not very comfortable with my body and menstruation. I would shove tampons up my sleeve while going to the bathroom and make sure I don't make wrapper noises inside there," Houser shared. More than 40% of US women say they have been period-shamed by men. Globally, women are advocating for period equity and destigmatization. And change is slowly happening. In the US, New York, Illinois, and Nevada among others have completely eliminated the tampon tax. But more work needs to be done to combat period shame and improve women's access to reproductive and menstrual health care. Dusenbery — author of Doing Harm: The Truth About How Bad Medicine and Lazy Science Leave Women Dismissed, Misdiagnosed, and Sickaward — highlighted the impact of period shame on access to medical care. Dusenbery contrasted her own relatively straightforward experience of being diagnosed with rheumatoid arthritis, an autoimmune disease with the experience of many female patients she's encountered in her who struggled to convince doctors of their pain. "Menstrual etiquette is the big underlying cause behind this. If women talk about painful periods, they are shut down and criticized, and told that they are making excuses; Employers say that they are trying to get out of work," Dusenbery added. As a result, many of the 7.6 million women estimated to have endometriosis in the US, go undiagnosed. "Women go about a decade before they are diagnosed with Endometriosis. And that's important because healthcare providers are saying, 'oh it's just normal cramps,'" she said. Both male and female health care providers lack awareness about the condition that affects 1 in 10 women, approximately 176 million women worldwide. And because the symptoms — pain and abnormal menstruation —are often "normalized," this can lead to a delay in diagnosis and treatment. While much of the panelists' discussion focused on the US, period stigmatization is a global issue. A poll conducted by the brand Always found 1 in 5 girls in the US have missed school because of inaccessibility to period products. In rural South Africa, some girls resort to using rugs and newspapers instead of pads and tampons. In Nepal, many girls sleep in secluded huts and sheds while menstruating. Rajna Shetty, who attended the talk, urged the panelists to establish a global channel where women across the world could come together to help each other. "I have lived with pain and stain for a lot of years, around 14 to be precise. I must acknowledge the fact that I am one of the privileged women in India; from my friends to boyfriends, to father to brother, everybody is comfortable to talk about periods," Shetty said. But this is certainly not the norm in India where, about 40% of women between the ages of 15 and 24 are unable to access sanitary products. This discrepancy is what inspired Shetty to quit her corporate job in New York to help women in India. "I am sure there is way we could all come together contribute [to ending period shame]," she said. And that's exactly what Wolf is hoping for. “'Regular people can get involved right away: donate in your office, make sure your office provides these things," she told Global Citizen, referring to menstrual hygiene products. "You can get involved at a higher level and start contacting your legislators, or get involved at a macro-level and become a strange person like me who makes this their hobby,” she added.